Also? I never love Twitter more than I do during the award announcements because my entire feed is just one excited or disappointed tweet after another about the awards. Nerd heaven. Anyway, I’m sure you’re all dying to hear my deep thoughts about what won. Caldecotts first, since that was the award I was most in the know about this year. by Jon Klassen. I read Klassen’s book, I Want My Hat Back, and I thought it was amusing, but I wasn’t such a fan that I read this latest one. In fact, I saw it at the bookstore when I was reading other Caldecott buzz books and decided not to read this one. I guess I picked wrong. I’ll be repenting at the library this week. illustrated by Peter Brown, written by Aaron Reynolds. I thought this book was extremely clever and included it in my Halloween book round up back in October. I feel very proud. Also, I’ve seen Peter Brown speak in person twice and he is just so delightful. So that makes me happy. Jon Klassen, written by Mac Barnett. I checked this one out months ago when mock Caldecott lists were starting to go around and. . . I do not get this book at all. I finished it, closed it, and immediately returned it to the library. Two points for Jon Klassen, none for Janssen. Vaccaro Seeger. I love this book so much and am just so happy to see it on this list. Toni Buzzeo. I have been meaning to pick this one up for ages, but it was never quite high enough on my list to use one of my precious reserve spots for it. And now that it has that silver sticker, it’ll probably take FOREVER for me to get a copy at the library. Pamela Zagarenski, written by Mary Logue. I only heard about this book last week when the librarian at storytime had it as one of the books about sleep/bedtime. But then she ran out of time, so I’ve only seen the cover. I think it’s a good list, although there were SO many good picture books this year, that I’m a bit sad to see several of my favorites not get an award. 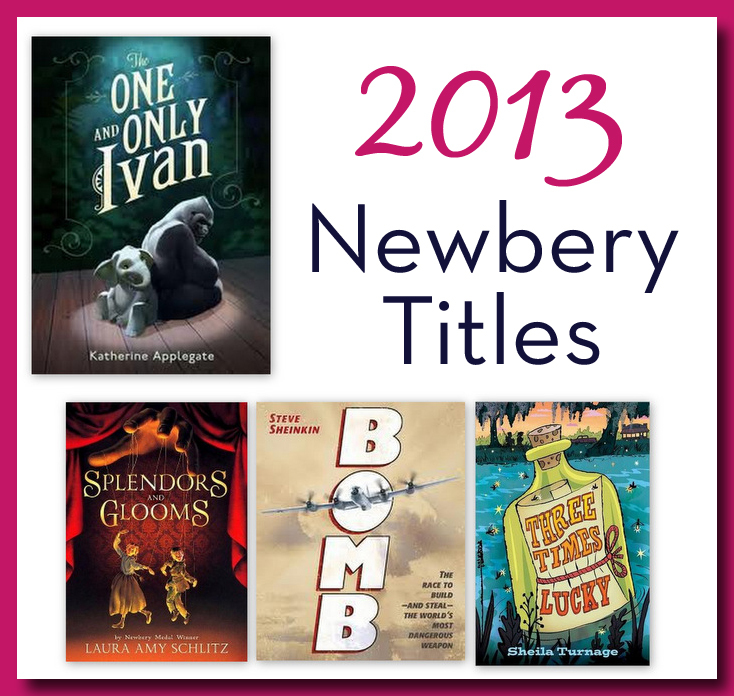 And then the Newbery. I have not been following middle grade books as closely this year as I have in the past (too much time reading non-fiction books about food, I guess). So the fact that I’d heard of all but the winner makes me feel quite pleased. Bomb: The Race to Build—and Steal—the World’s Most Dangerous Weapon by Steve Sheinkin. I started reading this one on Sunday night and immediately fell in love. Now I will have to read it very quickly because I doubt I’ll get the chance to renew it. Also, this book got BOTH of ALA’s awards for non-fiction (the YA one and the children’s one). Three Times Lucky by Sheila Turnage. I mentioned this one in my best of the year books too, so I’ll be over here patting myself on the back. Titanic: Voices from the Disaster by Deborah Hopkinson which was an honor for both non-fiction awards too. We’ve Got a Job: The 1963 Birmingham Children’s March written by Cynthia Levinson (also a non-fiction honor). Seraphina written by Rachel Hartman won the William C. Morris award. It’s about dragons, which makes me nervous, but I’m willing to be brave. All the books (present winners and older ones) on the Geisel award list which are for beginning readers. Really, so many good books out there. I love this golden age of children’s literature (and yes, I just said “golden age” like the stuffy librarian person I am inside). Any thoughts on the awards you’d like to share? Happiness and indignation are both welcome. 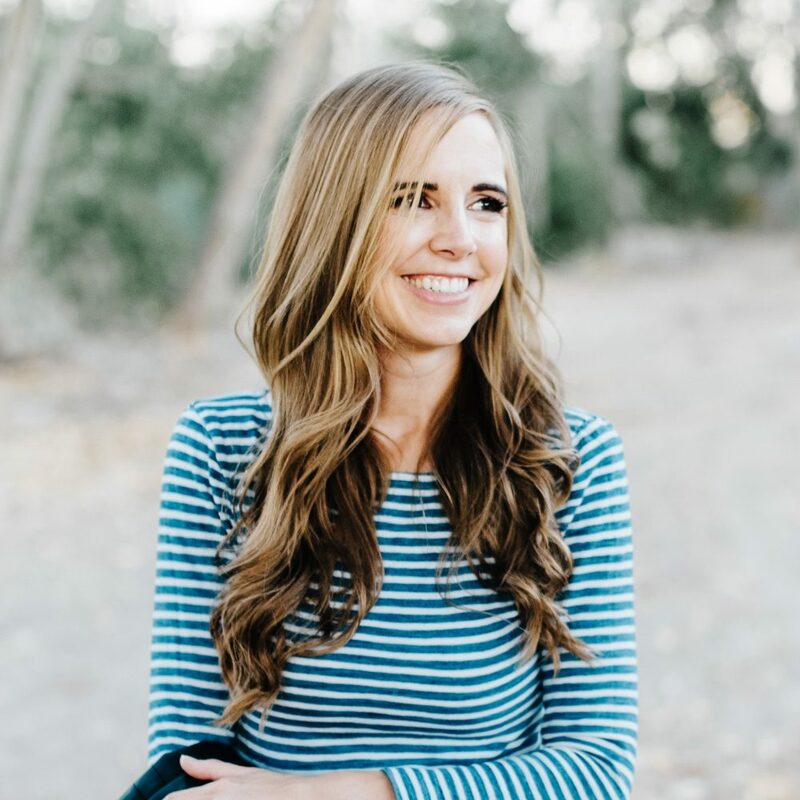 Janssen — What are some of the book blogs you follow? Are they mostly adult or children's literature? 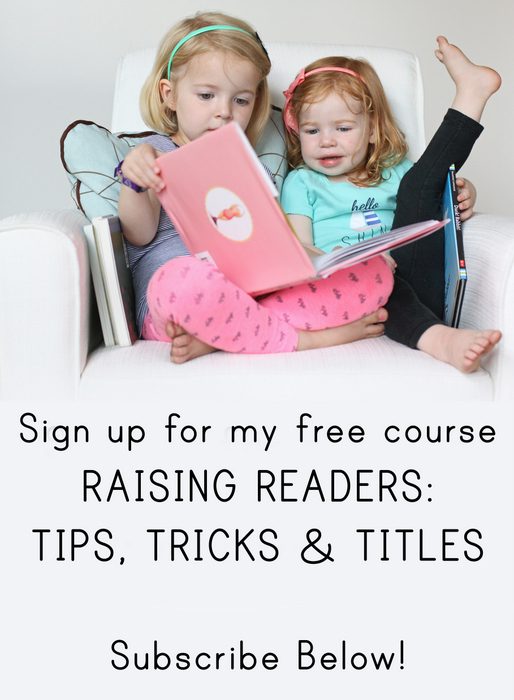 I have to admit that I stopped reading most book blogs a couple of years ago. I was just overwhelmed by how many books they wrote about and I couldn't keep up. Also, many many book blogs were all writing about the same books. It still does not appeal to me personally, being about animals and all…but I'm glad we have it! "Which books got the gold stickers?" The award that made me happiest was the Margaret A. Edwards Award. I adore Tamora Pierce. Her books are my comfort books when I have a bad day. I've met many people who love her but she is never recognized for her work. It's rare to find someone so beloved without a chain of awards. So when I saw her name on the list I ran screeching around the house. She has earned it. Embarrassingly, I've never read anything by Tamora Pierce, despite having heard of her for YEARS. She's the one who got me hooked on fantasy. I loved her as a teen. Her popularity has waned with the teens at my library (I only buy a select few of her new books), but her older series I think are still read pretty widely. What wonderful news about Tamora Pierce! When my daughter was in her early teens, we were quite involved with AOL chat rooms. Tammy showed up on a fairly regular basis. For my daughter's 13th birthday, I wrote to Tammy and purchased a set of autographed books of the Alanna series. Needless to say, they were a very special gift. I was jumping up and down every time BOMB won something! And right before each award it won was announced I told my staff, "I hope BOMB wins!" 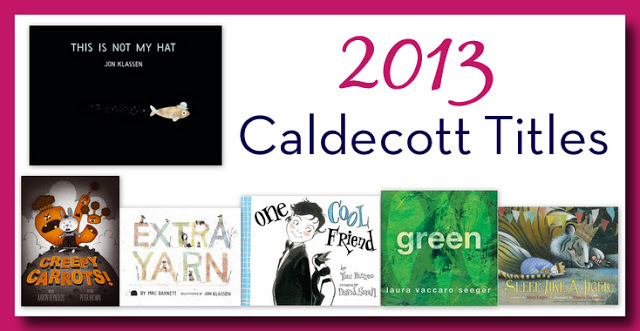 😀 😀 I was very pleased with the Caldecott books – several of those were highly discussed at our Mock Caldecott party! 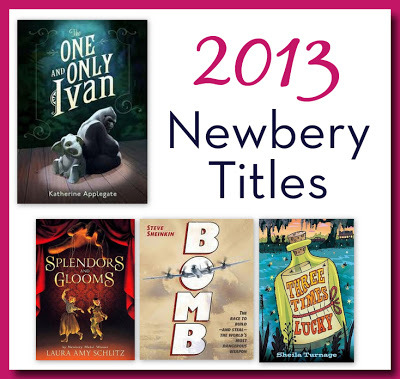 I was a little disappointed not to see Grace Lin's STARRY RIVER OF THE SKY recognized for Newbery, but I think IVAN is a great choice and will likely have a lot of kid appeal (which I know isn't under consideration but is very nice when we have those Newbery assignments come through…). You must read One and Only Ivan – so good and this is coming from someone that didn't like to watch Benji movies when I was little because I didn't like to see him get hurt, etc. I too was excited to hear who received the gold sticker. My 3 y.o. and I were actually at library storytime when a librarian came into the room to tell the other librarian who won. Kinda neat to hear their perspective. Bomb has just finally been ordered at my small-town public library, going to pick it up tonight. Were you surprised that there was only one Sibert honor that we read on the Cybils committee? As far as golden shades are involved, a easy one-color backdrop with a white-colored foil stickers will have the most visible effect which is less likely to be observed and gives a FINE effect.